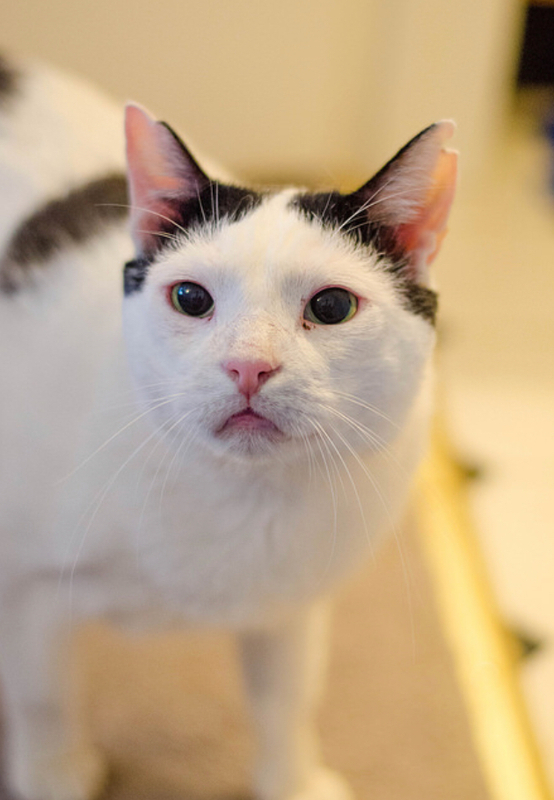 Snowy is our most overlooked cat which breaks our hearts because he is such a sweet boy. He was living outside in the Bronx and being fed by a kind woman. She was concerned for him because all of the other cats were picking on Snowy and she asked us to help. We had a foster lined up for him but they changed their minds after we had picked him up and had him vetted. He came back as FIV +. Fiv is a disease that weakens the immune system but cats with FIV can live a long healthy life as an indoor only cat. 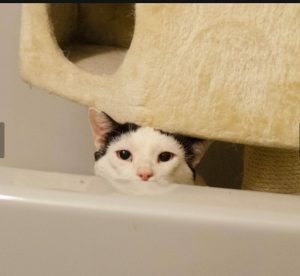 If the cat is neutered or spayed the chances of spreading it to other cats is low since they can’t get if from sharing food or water dishes, litter boxes or even grooming each other. We have been fighting to break the stigma attached to FIV because cats like Snowy deserve a home. Snowy is sweet. He just wants attention but is also good lying in his cat bed and taking a cat nap. When he came to us he was in bad shape from being outside. But now he is thriving. His cat is shiny and he has gained weight. The indoor life suits him! Snowy loves to play with toys and be pet. He can be a little shy with strangers at first but warms up very quickly. He has bonded with some of the low key dogs in his current foster home but some of them are too much for Snowy so he spends a lot of time separated which isn’t fair. He needs a home of his own where he can be free to roam and explore , to watch birds out the window and nap in sunbeams.